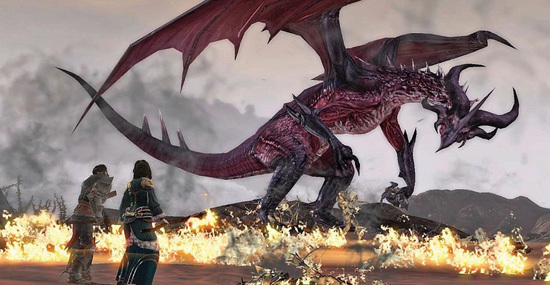 Dragon Age 2 tells the tale of the Ser Hawke. 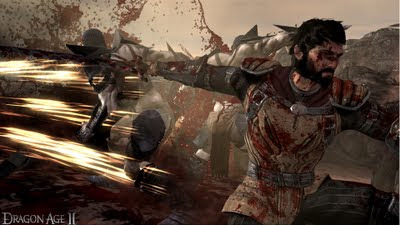 Forced out of Ferelden by the events of Dragon Age: Origins, Hawke and his family make a new home in Kirkwall. Forced to work in the slums to make a name for himself and earn some money, you play out Hawke's rise to power over a decade, and you see the events in which Hawke became known as the Champion of Ferelden. The story is told by a dwarf, Varric. One of your allies later in the game, he is telling the story of how you became the Champion to Cassandra Pentaghast, a Seeker, and how you play the game influences the colour that Varric paints you in. The trademark BioWare mechanic, choice. Good and evil, right and wrong, selfless or selfish. Each character gets a skill bonus depending on how much they like you. You can gain and lose allies for making a single choice. It's a great system, and it's good that BioWare are sticking with it, as it's so much more interesting and engrossing than standard cut scenes. Of course, actions speak louder than words, and the combat has received massive improvements since Origins. No longer is the combat slow and tiresome, more a chore than fun. Now the combat is fast, powerful and brutal. Severed limbs, exploding bodies and gallons of blood will be present in every fight, and it never gets old. The combat system had to be great in this game, to apologise for Origins, and it really delivers. Each class is also really fun to use for different combat situations. Rogues and mages are great for ranged attacks, whilst the warrior gets up close and personal to deliver an axe to their enemies face. Upon levelling ip your character, you are granted one ability point. These unlock new abilities which can improve attack, defence, stamina and can change the focus of attack. There are some devastating moves to be unlocked, and overall there are so many abilities. The game mainly takes place in Kirkwall. It's a decent sized city with the usual areas. Upper class streets of Hightown with beautiful flowers, mansions and snooty folk. Then there is Lotown, the slums of Kirkwall, home to all the degenerates and drunks. The names aren't exactly imaginative, but the places are all distinctive. Kirkwall is where you will complete the majority of the missions on the game. And therein lies the problem. You will spend a high percentage of your time travelling between the various districts of Kirkwall, talking to or killing some people, and then returning to whoever gave you the quest. Whilst the battles are fun, and the exploring and levelling system are certainly rewarding, it gets incredibly tedious, once you have travelled between two locations many times, just to talk to people. The side quests definitely need work, and the confines of Kirkwall soon become too familiar. RPGs of this calibre need a huge open world, akin to Oblivion. With Skyrim looming, you would have expected BioWare to put in more effort to ensure that this is a definite contender. The main quest is good, however, and sees you visiting new locations, like the Deep Roads and many others, far from the repetitiveness that is Kirkwall. There is betrayal, transformations, deaths, and some pretty breathtaking boss battles. As you are playing Varric's version of events, and Varric is a great liar, you never know if what you are playing is what actually happened. Sometimes he is caught out, but playing through the lies is fun, as you experience enhanced skills and powers. Dragon Age 2 is a fantastic RPG. So much better than Origins, with a much broader appeal. Better visuals, characters with interesting stories and emotions, a completely overhauled battle system and generally improved gameplay, it is only let down by the restrictive world. Fans of the original will completely lap this up. Don't expect anything on the scale of the Elder Scrolls titles, but definitely don't miss it.